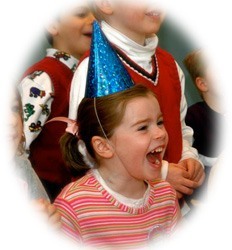 Make Your Child's Birthday Amazing! Bonaparté's Award-Winning Magic Presentations are great for All-Age Birthday Celebrations. smiles on the faces of Guests of Honor from ages 4 to 104! Birthday Party Celebrations with Bonaparté. Your child is the Magic Superstar! Imagine their delight when they wave a wand and a real live bunny appears! wanting Bonaparte for their birthday party!"